Accommodation for 16 guests. 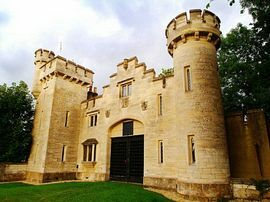 Sleeps 12 in main castle and 4 in Clock House. 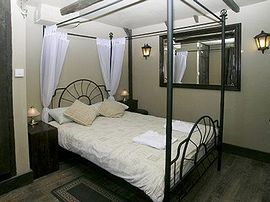 Castle has six double bedrooms all with 4 poster beds, many en-suite. 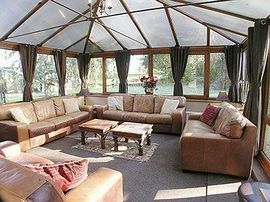 Suited for large groups with five communal rooms; Conservatory, Drawing Room, Great Hall, Study. 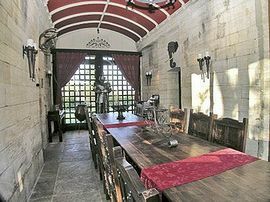 Dining: Great Hall features long medieval table, which accommodates up to 20 guests. Great for a banquet, medieval feast or murder mystery weekend. Lounge: Four sofas. Kitchen Country Cottage Style: All mod cons including dishwasher, Aga and granite worktops. Main features: Rupunzel's tower bedroom. Main turret with Observatory - star gazing. Tapestry panelled hallways in East and West wings. Feature for the elderly: Ground floor W/C and en-suite bedroom. Parkland teeming with wildlife. Secluded - nearest neighbour one mile. Ground mans Cottage (now Games Barn), free range chickens with eggs. The Summer House overlooking Duck Lake. Victorian resting shed. Fruit Orchard. Kids play area with swings and climbing frames. 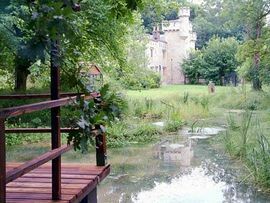 Walking distance: Old ruins, paddock, large fishing lake, woodlands. Ideally situated off A350 to discover Bath, Stonehenge, Glastonbury, Stourhead and Longleat House plus safari. Stunning Grade II listed folly castle. Great for a banquet, medieval feast, murder mystery breaks. DIRECTIONS: M4 Junction 17, reset car trip meter. A350 to Chippenham (stay on A350 until you reach Long's Park Castle). At exactly 16 miles (about 20 mins or so), you pass the sign for West Ashton, then a lay-by on the right and Long's Park Castle is visible through the woods on the left. Don't turn off into the village of West Ashton! The driveway is actually off the A350. Train: Trowbridge Station or Westbury Station for mainline London/Penzance trains, and then take a Taxi for an 8-minute journey. Prices start from: £1255.00 to £2755.00 Peak season.